Just the idea of this book, loaned to me by my grandson, Jack, spooked me out. Whenever the heroine, Jem, looks into someone's eyes, she can see the date they will die. Not surprisingly, she tries her hardest not to look into anyone's eyes, earning herself a reputation for being wilful, distant and a loner. It's not until she meets Spider that life seems to take a turn for the better - though not for long. A trip to London which should have been a fun day out turns into a nghtmare as Jem foresees a tragedy about to happen when she realises that everyone around her has the same date in their eyes - today's date. She also carries the awful knowledge that she knows when Spider will die. Is there any way the numbers can be defeated? Can she, somehow, prevent his death? I loved the character of brave, lonely Jem, unwilling to let down her guard but so clearly craving love and companionship. Spider, too, was more than the gangly, smelly misfit he appeared and the relationship which slowly developed between the two was strangely sweet. Spider's gran, the enigmatic Val, and well-meaning but struggling foster mother Karen added background to the characters of both Spider and Jem. A survey reported in the newspapers this week reported that, while many of us will fib about reading "chick lit" or the likes of "Fifty Shades of Grey" - we are quite happy to admit to reading children's books. I reckon that's because so much fiction written for today's children presents us with really challenging, thought-provoking reading. 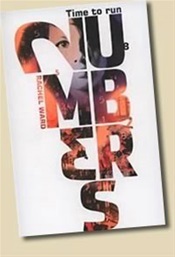 Rachel Ward's Numbers is one such book. Once again, I won't spoil the ending for you - but it made the hairs stand up on the back of my neck!